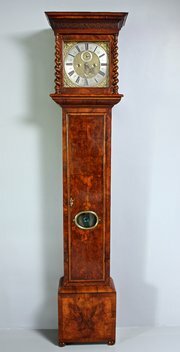 Walnut Cased Chris Gould Longcase Clock. 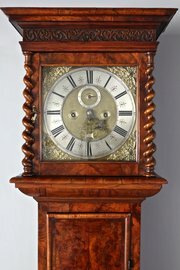 DescriptionFine late 17th century longcase clock by one of the best makers of the period, Christopher Gould. The figured walnut case is beautifully proportioned, slim with a long door and small plinth standing on tiny bun feet. It has a square topped hood that is removed upwards, and blind carved fretwork to the cornice. At the sides, barley twist pilasters and glass side panels gives a sense of lightness. The door contains an oval brass edged lenticle glass, and is finished with a half-round moulding. 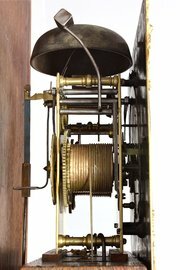 The signed 11 inch brass dial has a silvered chapter ring with Roman hours and Arabic minutes, a silvered seconds ring, and a date aperture. Behind it sits a 5 pillar 8 day movement. 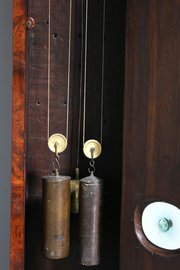 Christopher Gould was born about 1660 and admitted to the Clockmakers Company as a Free Brother in 1682. 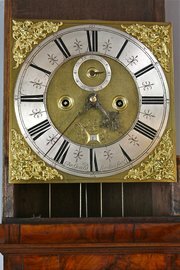 His longcase clocks made in the late 17th and early 18th centuries are among the most decorated and attractive of this period. This clock is in fine condition, with a superb colour and surface to the case, and the movement in excellent working order. Circa 1690.